Gibson is a former lead guitarist of a well-known rock band called The Warriors of Justice. He was the co-founder of the band with vocalist D.B. Jackson, bass guitarist Rick Backer, keytarist Yamaha Suzuki, and drummer Bam Sleishman and lived with the band throughout live concerts and studio recordings for 6 years up until Gibson broke up from the band to live his own life. 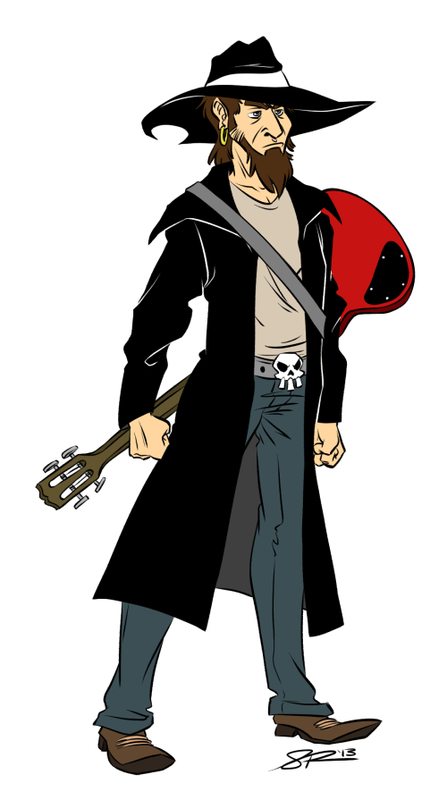 Gibson once gained Sentai powers after he smashed a mysterious giant crystal with his guitar. But after his death, he lost his ability to turn Sentai but still regained its powers in human form. Gibson left behind his original Flying V to Kirin after the end of the Sentai Tournament; he now owns a Gibson EB-3. As explained, he has awesome powers. One such thing is that he can shoot out lightning from the headstock of his guitar just by playing it. He can also smash his guitar onto his enemies with such incredible force, yet his guitar will never break from impact. He now wanders the Underworld for food and shelter, and beats the crap out of anyone that gets in his way.